Lie on back with arms at sides. Hips and knees bent to 90 degrees. 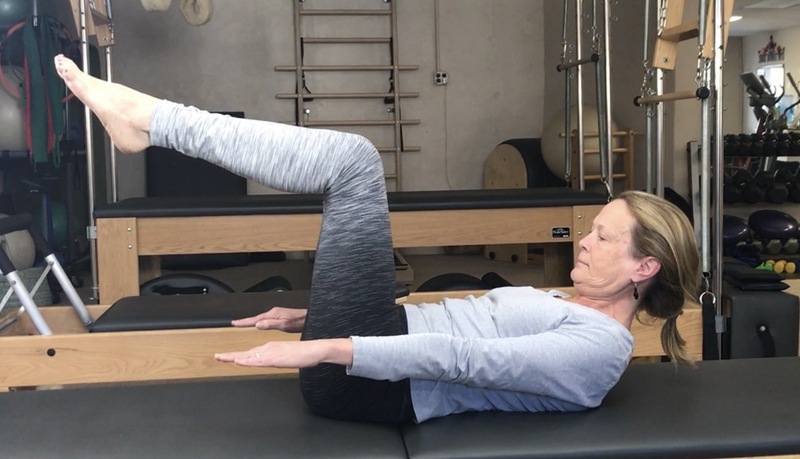 Maintain a neutral spine position with abdominals engaged. Inhale to prepare, exhale lift head and curl upper torso. Arms parallel to the floor. Start pumping arms in small flutters up and down. Inhale for five pumps then exhale for five pumps totaling 10 repetitions: Repeat 10 times for a total of 100. Support head with one hand while other arm pumps and split repetitions. If neck issues are present, rest head on mat. Lie on back and engage abdominals in a neutral spine position. Legs together and strait on mat. Shoulders are back and down. Exhale, lift head and curl spine/torso sequentially from the mat bone by bone. Reach forward and lengthen the spine up and over legs. Inhale to prepare, exhale roll back down bone by bone with abdominals engaged. Place feet under strap/use a band around feet for support. Start with bent knee working to lengthened leg position. Start in a seated bent knee position supporting the roll up and down with hands on legs. One leg is strait on mat. One leg is bent to 90 degrees at hip and knee. Lengthen same leg out to a forty five degree angle. Circle leg from hip toward body Initiating movement from abdominal stabilization. Inhale for half of the circle and exhale for second half of circle. Bend strait leg on mat at knee and foot flat for added stability. Start in a seated position. Bend knees toward chest holding each leg at shins. Lift feet off mat and balance on sit bones. Round the spine in a C-curve. Inhale, roll back to shoulders. Exhale, roll up to balance on sit bones. 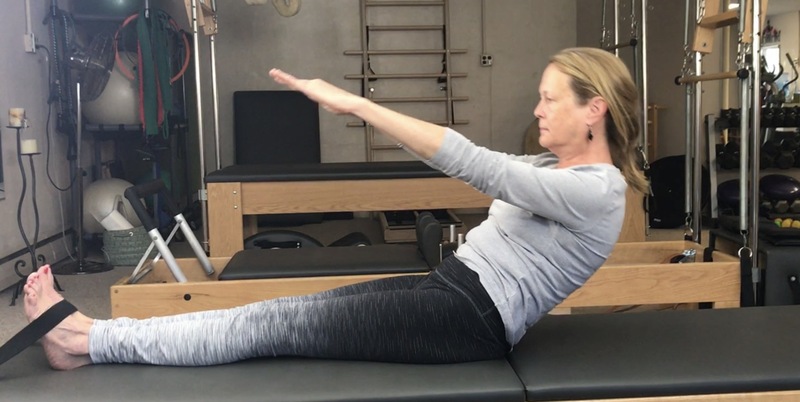 Hold balance position on sit bones without rolling. Sit tall on sit bones. Legs strait and shoulder-width apart. Arms parallel in front of you. Inhale to prepare, exhale articulate spine forward bone by bone by leading with crown of head. Lift up and over legs. Reach dictated by articulation of spine, not by leaning forward at hips. Inhale to stack spine up bone by bone to lengthened seated position.